Genuine Buffalo Leather is a kind of leather working process,usually using bull leather. Genuine Buffalo Leather is a kind of leather working process,usually using bull leather. You will find different color from different visual angle on the same piece leather.It is amazing top quality leather. The scratches make product look retro and stylish,and it is easy to deal with. 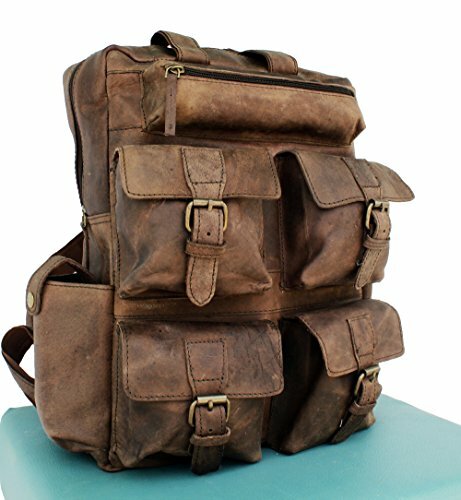 This leather rucksack is ideal for both college and office going men and women who want a practical and stylish bag for their daily use and trips. This handcrafted satchel can be used as a college bag and as a bag for small trips / adventures with friends and family. This bag can fit water bottles / books / i pad upto 10 inches / wallets etc. Our bags are made from high end buffalo leather and lined with canvas. Four Outer Pockets, One main compartment with Laptop Padding, One internal zipper pocket, Two small side pockets and inside sections to carry cellphone , cards/ pens etc. If you have any questions about this product by Art On Leather, contact us by completing and submitting the form below. If you are looking for a specif part number, please include it with your message.